So my prediction of a Federer demolition job proved to be wholly innacurate as he went down in 3 sets, meaning he's lost to Tsonga twice on the bounce now. I didn't stay up to watch the match – but trawling through youtube highlights has given me a fair indication of what happened. He was pretty much blown off the court again. Which doesn't make great viewing, nor does it fill Fed fans with confidence for the remainder of the hard court season. In many respects this was a typical Fed match – especially similar to what we saw from him throughout 2008 and post Australian 2010. Misses a chance to win the 1st set, manages to up his level and take the 2nd, only to self combust and throw away the 3rd set and with it the match. Tsonga is indeed a good player, he can hit big, but really Federer shouldn't be losing to this guy – once is forgiveable, twice on the bounce we must ask questions. Again he seemed to show a lack of fight, looking demoralised on court throughout the third set. Power hitters seem to have too much these days for Federer as soon as they start hitting with any level of consistency, which 3/4 years ago just didn't happen. From what I've seen Fed looked pretty clueless in parts – looping in forehands, poor footwork and some seriously poor approach play. I kinda thought beforehand Annacone would have thought up some solid tactics to beat Tsonga. Passive play and being content with trying to rally with him aren't going to get the job done. The only thing propping up Federers game right now is his serve, he seriously needs to work on the other aspects of his game if he wants to make a challenge. Granted, it's still early days, so maybe things will take a step in the right direction in Cincy and towards the US Open but he needs a shakeup and fast. Looking at the stats of the match, they aren't that bad, it seems Rogers second serve took abit of a battering, he commited way more unforced errors and Rogers 25% break point conversion rate wasn't great. 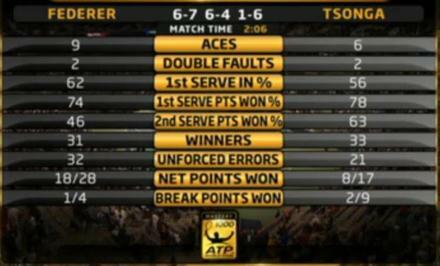 But at the end of the day – it's the result that counts and it's Tsongas name on the sheet. Tsonga will probably get past Almagro, then lose to Djokovic in the Semi's. With all the top players out barring Novak, the Rogers Cup has definitely being relegated to the bottom of my TV schedule. So all I can do now is hope Roger puts some hours in on the practice court, looks at where he's going wrong and puts a performance in at Cincinnati.